Paralympian Dame Tanni Grey Thompson has criticised Tiger Woods for using the word "spaz" to describe his performance at the Masters. Woods, who has since apologised, came under fire for using the word in reference to his putting display. "I think he was a bit stupid saying something off the cuff in that way," she told BBC Radio Five Live. "It was a stupid comment but I won't get upset by it - there are bigger battles to fight." She added: "My worry is people and youngsters seeing that someone like Tiger Woods is using this kind of terminology. If they think it's OK for him to use it, then do they think it's OK for them to use it as well? "You know he's not one of the rough football players who's gambling and getting drunk and being in clubs, you know he's quite a straight guy. "I don't think it is a nice word for anyone to use but I think we get upset by terminology. "For example, in America, handicapped is an acceptable term which it isn't here - it's quite insulting. "I don't think he meant to be offensive but nobody in his position should be saying it. "I bet he won't say it again." 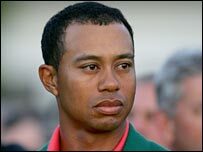 Woods's spokesman Mark Steinberg later said: "Tiger meant nothing derogatory to any person or persons and apologises for any offence caused."